Ever since Mario Maker arrived, Nintendo fans have been making all kinds of cool Mario levels. Most of them are just crazy levels that are super hard to complete. The most challenging and nail biting level of them all? The marriage proposal level. 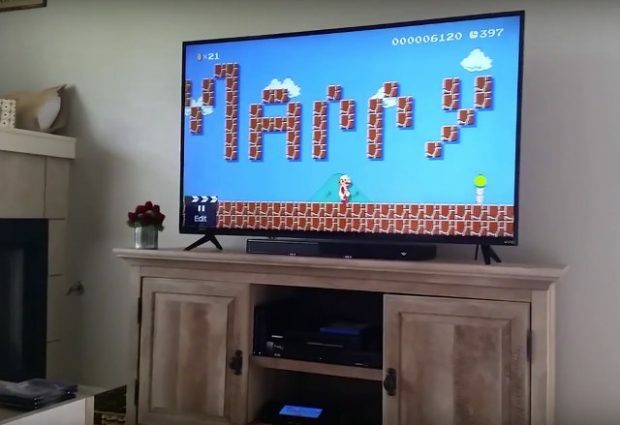 Check out this video from Geekologie reader Shane, who proposes to his girlfriend Pam with a special Mario Maker level he built. It starts out normally enough, but as she gets to the end of the level, the bricks and blocks spell out “Pam Will You Marry Me?” Now that’s how a geek proposes. Pam gets pretty excited and emotional and of course she says “yes.” So as it turns out, his princess was not in another castle. Congratulations to the happy couple. That is putting Mario Maker to good use. If you want to marry a woman named Pam, the level code is 7A61-0000-0245-8DE8.